Garri is a popular food that is mostly consumed by people in west Africa, in countries like Nigeria, Togo, Ghana etc. It is a common food in Nigeria, and it is greatly loved by many because it of the nutritional benefits it gives and also it makes one to feel full after it is consumed. No wonder some people characterised garri is a perfect food for a weight loss program. Nigerians love eating garri because of its greats starch content, which makes it possible for it to release a large amount of energy after it have been broken down through the process of glycolysis. 1. It is consumed by drinking, in a preparation consisting of garri, sugar, water, and some other ingredients like groundnut, coconut, fish, beans, milk etc. 2. It is consumed by swallowing (product known as eba). This method involved pouring hot water in the garri powder granules, mix it to form a paste-like or dough structure. The product is now swallowed in combination of various kinds of soup. How Does The Appearance Of Garri Look Like? · Extra coarse: passes through 1.25 mm to 2.0 mm aperture sieve. Nigeria as a country have a very good climate for the cultivation of cassava, and as a result of the abundant supply of cassava, garri is a well known cassava based grain that is readily available in the Nigerian market at all times of the year. There is a funny assumption that "if garri fails to exist in Nigeria, then a lot of people will surely go hungry". This statement agrees with the fact that there is no average Nigeria that does not love eating garri, either been soaked in water and drank or being swallowed with diverse soups. A lot of concerns and worries have already been developed because of the rate at which Nigeria exports cassava to countries like China, it is one way or the other making the commodity to be less available or relatively scarce. With the fast rate of urbanization and growth in sub-Saharan Africa, there has been an increase in demand for convenience foods such as garri. Cassava roots serves as an ideal raw material for the production of this convenience foods, since they are easy to process and posses great nutritional benefits accompanied with their nice flavours. Like we all know, the cassava roots are been harvested from the ground, hence, they are covered with dirt and soil and some might eventually be damaged already. Only good harvested roots are transported from the farm to the processing factory (or just in a local neighbourhood, in the case of traditional method of processing). When the roots arrived the processing factory, they are peeled in order to remove the outer brown covering and the inner layer that have a cream-like colour, leaving behind the inner white root. The inner white root is then thoroughly washed with clean water to remove any form of stains or dirt that is stills found on it. The next step involves the grating of the cassava roots into mash or pulp. The purpose of this process is to remove the cyanide content of the cassava, thereby enabling the root to be safe to be consumed. perforated metal sheets are been used in the traditional grating of cassava, though using it is very slow and consumes a lot of labour and energy. Mechanized graters are normally used in large factories that are responsible for the production of large amount of garri for that will serve a greater population of consumers. The mechanized grater also meets the market demands and standards. Still in the process of removing the cyanide content in the cassava mash, the de-watering and fermenting process is been employed. This step is done traditionally by using logs or stones as weights to press the large amount of water out of the bags containing the cassava mash. The bags are then finally allowed to drain and ferment for some few days. The longer the days of fermentation, the more sour the garri tastes. Just like the traditional method of grating, this method is quite slow and time consuming, and most especially, it is unhygienic, which makes it not suitable for a large cassava processing business. Mechanized methods that are safer are been employed in large factories. The bagged cassava mash is left on the fermentation rack for one or more days like i earlier stated before de-watering. During the end of the fermentation process, the mash will turn into a firm, wet cake. This step involves sieving the wet cakes into small pieces know as grits, and then you roast or fry the grits in a hot frying pan or tray to form the dry and crispy end product known as garri. Garri normally have a white or creamy colour, but can be turned into yellow when red palm oil is added to the cake before frying. This type of garri is commonly found mostly in the mid-western part of Nigeria, it is also known "Bendel garr". This class of garri is achieve when red pal oil is been added to the cassava mash during the process of production. Addition of red palm oil to garri also helps in reducing the cyanide content of the cassava and also gives the garri a uniue flavour. The white garri is achieved when you follow all the normal steps of production without adding red palm oil to the cassava mash before grating. Ijebu is place found in the south-western part of Nigeria, Ogun state to be particular. The name "Ijebu garri" came to existence as a result of the style of garri production that is best adopted by the Ijebu people in Nigeria. Ijebu garri is been processed using the normal steps, but the distinct feature about it is that the cassava mash is been allowed to ferment for up to seven days, which increases its sour taste and flavour. No palm oil is been added like the Bendel garri, and it is also fried to become much crisped. The Ijebu garri have a characteristic sharp aaste (like most people will say in Nigeria, the taste slaps the mouth), and it is less starchy compared to others. Anybody that is from the south-western part of Nigeria, or those that have been residents in that are for a long time will definitely understand the great feeling derived from drinking ijebu garri with fried fish. Garri is highly rich in starch and fibre content. It is also noticed to contain some amount of proteins and some essential vitamins. 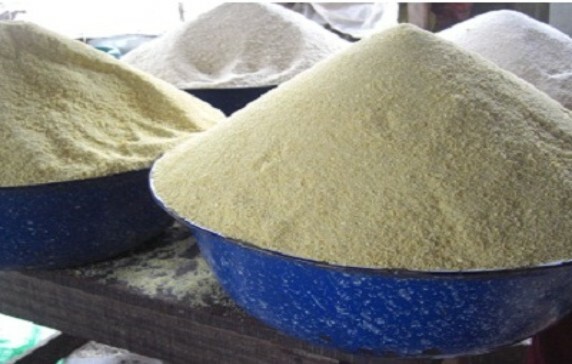 The fibre content of garri makes one to feel full when it is been consumed, and it is very helpful in preventing ailments such as constipation and bowel diseases. · Because of its fibre content, it helps in fighting against constipation and other bowel diseases. · It provides us with energy because of its high starchy content. · Red or yellow garri contains fats and oils, which are great sources of additional nutrients and health benefits. · The major health benefits of garri is that it serves as a complementary food to balance our diet. For example, garii (eba) is being eaten with soups that contain foods such as vegetables, meats, fish, fats and oil, minerals etc., and they provide various nutrients that makes the meal to be a balanced diet.